Some cool stuff: I was sent this beautiful animated Angora/ Mocheril fanart by long-time reader Jazyl , who make the webcomic The Beast Legion :] Thanks very much Jazyl! Today’s bonus art: just this page minus all the text and lines, sometimes I like looking at the page like this because it looks more interesting than the final, haha. Trying to think if anything else cool is happening, but not really. Anything fun happening with you guys? I’ve lost track of who is who. Things were simple back with Angora, Pinter & 2xTan. Rana is the older sister. Hyla is the little brat- I mean younger sister. Tesca is the servant who is supposed to be watching Hyla (but isn’t very good at it). The only character that we’ve met before (in the past 3 pages) is Rana, the rest are being introduced as you read in glacial webcomic fashion. By “glacial”, I imagine you mean “carving a valley through the plateau of our personalities, leaving behind only a few peculiar rock formations and the crumbling morraine of our feels”, yes? You are but till to me, yes. The problem is that there are too many names to remember. The comic “Vattu” has this problem as well, but (also like Vattu) the characters are easy enough to tell apart visually that the names become a bit irrelevant. Sure, I see what you’re saying. But just a protip, you don’t have to remember all the names XD The main characters are on the cast page, and some people like the servants or side characters will come in and out periodically (or just be gone forever like Kiz and and the other loggers from Ch1). As long as you can visually remember the main characters you should be able to read through okay. Fun fact that protip works for life too, just as long as you can find the cast page. Looks like Rana gets her temper from her dad. Although I suppose having your sleep interrupted 3 days a week would make anyone cranky. Little sisters excel at making their older siblings cranky. It is a gift they have. Get that kid a leash! You are very welcome Der-Shing. I love this scene & had a ton of fun for 2 hours creating it & at the same time got to read the comic. I love to test my self by animating different styles & I love how unique your’s is. :) Will try to do more as & when I get the time. a nightmare, she says, a huge grin on her face. Well, *someone* inherited her father’s temperament! But don’t tell her that, I don’t think she’d take it well. I was just wondering what year it is? I see everyones birth dates, but I don’t know how old they are because the current year is unknown? Sorry if I missed it, or something. Don’t worry XD It is page 3. In a book you wouldn’t think twice probably but for longform it’s gonna take a while to cement. You’re right – it’ll probably make more sense in the next few pages. I’m just not the sharpest tool in the shed sometimes. Poor Tesca tho – she has some impressive bags under her eyes. No it’s fine! Actually I think I might reword that part since it maybe is a bit more opaque than I wanted. It took me a moment to get it as well. Panel 1 Rana talks to both Tesca and Hyla. In between shouting at Tesca through the door, she scolds her little sister Hyla for locking them both in her room from the inside. 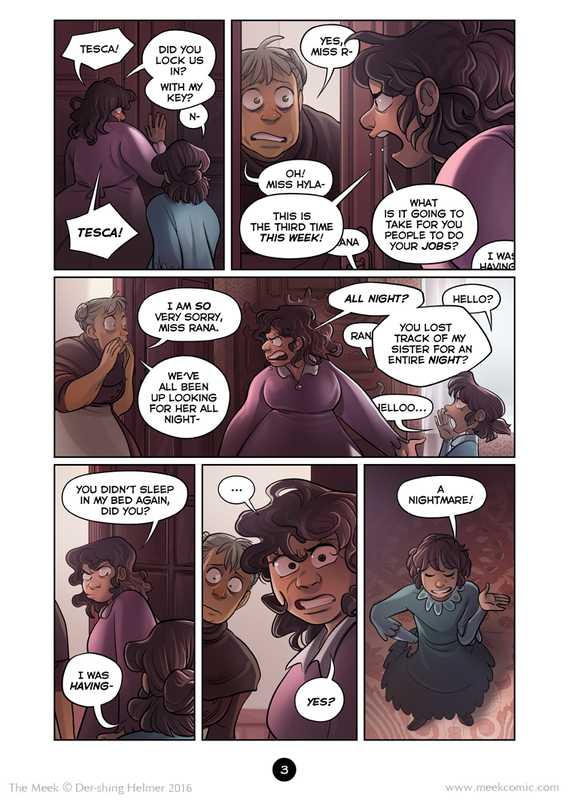 I love Rana’s expressions on this page! She seems a little harsh on the servant. Then again, if this is the third time, you would think they’d figure out that Hyla tends to go to her sister’s room, and not spend time searching all the other places. As a little sibling, I take offense to the assertion that we are just “the worst”! You will hear nothing but good things about me from my sister! …Well except for that time I was curious about how VHS worked, pulled out the tape, and her favorite movie never played right since, but I just consider that subconscious revenge for my sister’s desire to have me named “Sleeping Beauty”. Oh yeah?! Well my older sister accidentally dropped my GBA in the toilet and the sound was wonky ever since! Worse, I didn’t even find this out until after I got a DS! I feel Rana so much in this panel, as I have a sister who is 11 years younger than me and I will often find her sleeping in my bed or on my computer when I wake up. It is not as lovely or endearing as one would assume. Further than that, Der-shing, you’re doing an outstanding job maintaining all of your universes. Your characters are distinct, well thought out, and – in my opinion – memorable. I struggle in understanding how people can say what they’re saying, particularly in regards to the names or the plot lines? I think this is due to the fact that I have a minute understanding of all the hard work that goes into your art and storylines. And not only do I respect the process, but I respect all the hard work that is imbued in every facet of maintaining an online comic that is essentially pro-bono. As a long time follower of your work, please allow me to say that I ardently think you are doing such a wonderful job. I enjoy every page that you put up, and the minute I can afford to donate to your Patreon, I know I will. As someone who has neither younger siblings/children, nor an apparently internal threat to protect them from, I may be out of my depth here. BUT! I must wonder if Rana’s suspicions of her father’s (lack of) innocence in her mother’s death are becoming evident here, alongside the anger at her sister’s intrusion. After all, if he did away with mummy dearest, what’s to stop Luca from murdering his progeny and pinning it on hostile foreign agents? I sense that Hyla is a badass-to-be. A few more years and I believe she might become a force to be seriously reckoned with!